Bring water to a boil. Add penne and cook approximately 3-4 min less than stated on the package. Without heating the oil first, put all ingredients: olive oil, garlic, tomatoes, zucchini, carrot and celery mixture, and Italian Seasoning in a pan and cook for about 30 min on medium heat. 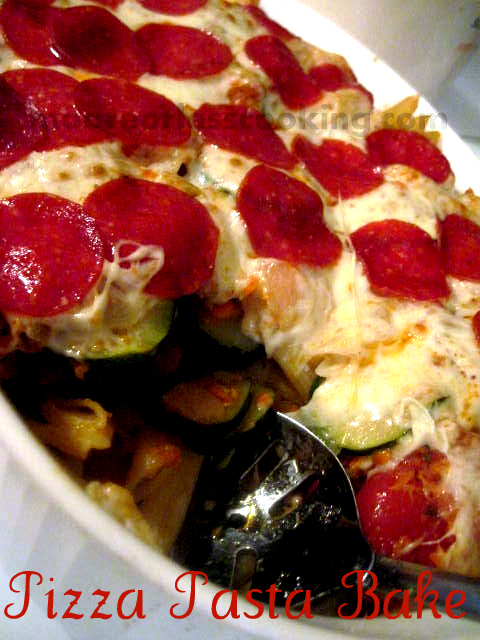 Drain the pasta and toss into a greased casserole dish. Add the cooked vegetable tomato sauce. Combine pasta and sauce. Then place sliced cheese over pasta. Place sliced pepperoni over cheese. Bake in oven covered for about 20 minutes, remove cover and cook for another 10 minutes until cheese is bubbly and golden. This looks SO easy and SO delicious, Nettie! I’m giving it a try SOON!